I spotted this Mug of the Month in my Aunty's kitchen. 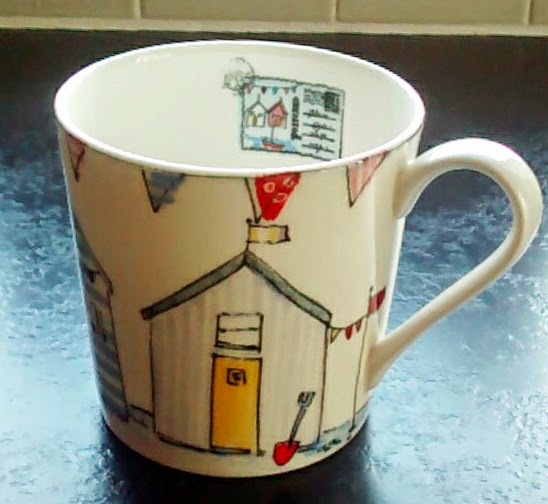 I love the little seaside beach huts lined up in different colours, and what is even more special is the little postcard design on the inside of the mug. This cute design is from M&S (RRP: £6.00). I'm going to buy one for my morning tea in work, so when I'm cooped up in the gorgeous summer weather I can dream about summer holidays; of ice creams, fish and chip suppers and getting sand between my toes.